World land speed record holder, published author, father and husband. I'm fortunate to have a wonderful family and great friends. What else is there? Stories and comments related to writing and new authors. One Author's opinions about marketing, self promotion, and working outside the box. Did I mention I also drive a 350 mph streamlined motorcycle? As Per His Web Site Blog. In land speed racing there are class records for various engine displacements; faired, unfaired; streamliners, etc. For me the only one that mattered was the ultimate, unlimited record. Fastest motorcycle...ever. I learned a lot talking to people at various trade shows after we clinched the title. 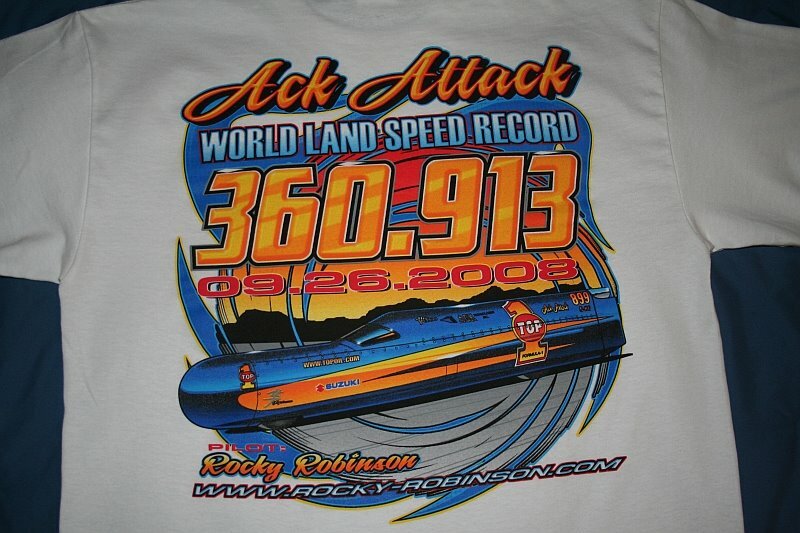 (360.913 mph / Sept. 26, 2008) The Ack Attack draws a lot of attention, and rightfully so. It is currently the world's fastest motorcycle. But listening to the comments made by enthusiasts and fellow racers, it's more than that to some. "I'm so glad a real motorcycle has the record again", was mentioned more times than I care to remember. The meaning behind this is simple. In their opinion the Bub machine (former record holder) doesn't have a motorcycle engine. There are several rules defining a "motorcycle" in land speed racing, or any other form of motorcycle racing for that matter. But defining a motorcycle in the eyes of the general public is this: it must have only two wheels and it must use a motorcycle engine. The argument they (Team Bub) choose to make is that the "engine" was never used in anything else other than their motorcycle streamliner, therefore it is a motorcycle engine. The fact that they could build a one-off, 3000cc V4, turbo-charged unit designed and built specifically for land speed racing is a huge accomplishment. The motor works great. I know because I have more seat time running this motor than anyone else. People marvel at the technology. Is it a true motorcycle engine? You decide. The fun thing about chasing the ultimate two-wheel record is innovation and the different approaches used by the different teams. The Ack Attack approach is horsepower, horsepower, horsepower. The machine is oversized, excessively heavy, and the least aerodynamic of the top three contendors. It is also probably the safest. With rider and fluids in place, the machine weighs over 2000 pounds. The steel roll cage is purposely over-engineered for safety. (and it has been tested and passed with flying colors) To compensate for the additonal weight and larger profile the Ack Attack produces nearly twice the horsepower of it's nearest rival. Sam Wheeler's EZ Hook streamliner is probably one of the favorites for a number of reasons. For one, Sam is a very likable guy. In 2006 even though the Ack Attack and Bub teams both broke the current world record, it was Sam who left with the fastest single run of the day. Sam was the fastest man on two wheels on numerous occassions, though he has yet to put two successful runs together to achieve the holy grail of land speed racing, the ultimate two-wheel record. His machine is by far the lightest, most aerodynamic machine of the big three contendors. It also produces the least amount of horsepower, though by design it requires much less to get the job done. There are new streamliners being built and the quest to be the "fastest" will continue. The next milestone for motorcycles is the 400 MPH mark. I can't say whether any one of us will be the first to reach it, but it will happen sometime in the not too distant future. The Ack Attack is officially "retired" at this point and I'm not sure if it will ever compete again. As Mike Akatiff likes to say, "never say never". So who knows. I know our competition is working feverishly for a few extra horsepower and a chance to steal the crown. There will always be someone faster. I know I've gotten a little off track lately with my blog. Truth be told my writing career is a long term project which continues to grow and will always be my passion, but for now I'm living in the present. My land speed racing career is fleeting. Former world's fastest motorcyclist, Dave Campos, (who held the record for 16 years before me) had a great analogy for being the world's fastest. He likened it to standing on a block of ice with a noose around your neck and your hands tied behind your back. I found that out the hard way in 2006, holding the record for only two days before slipping from the top rung in motorcycling. Thankfully, we kept going and have returned to the top of the frozen pedestal with golf shoes on hoping for better grip. A T-Shirt has been made in celebration of our record year. Sizes available are S-3X. The shirts are 100% cotton and are pre-shrunk. Visit my website at: http://www.rocky-robinson.com/ for information on how to get yours. Watch History Being Made... 360.913 MPH! There are a lot of strange happenings when competing on a motorcycle that travels half the speed of sound. Here you see dry ice being loaded into the intercooler before our record run. Cooler air = more horsepower. The Ack Attack produces more of that than any other motorcycle in the world. If a picture's worth a 1000 words, this next video will surely be a mouthful! Click on the link and watch as we make our record setting runs at the famed Bonneville Salt Flats. What a week it's been! The Top One Shootout took place this last week (Sept. 22-26) at the Bonneville Salt Flats in Utah. Mike Cook ran the meet and provided 12 miles of smooth, hard salt. This was a special event, by invitation only. The best streamliner cars and motorcycles were invited to compete for world records in a world class environment. We had our share of problems: handling issues and instability on the salt; gusting winds that nearly blew the Ack Attack off course; and a blown mainshaft that required an engine change that challenged the crew which came through with flying colors. Leo Hess, driving a big inch nitro burning V Twin streamliner crashed Thursday afternoon right before the Ack Attack was scheduled to run, ending the meet for the day. With one day left, and a lingering weather system, we hoped we would get one more chance. Friday morning came and we were on the salt before the sun came up. The final day officially started at 7:30, and the crew had the Ack Attack already staged at the far end of the course. The machine looked a little different than when we arrived as the rear doors were removed (they were added for streamlining, bringing the rear of the machine to a point tapering like the wing of an airplane). Winds were steady and within our requirements. It wasn't fully daylight when the motors were fired and Mike Akatiff pushed me off heading torward Hwy 80. The return run was a lot of fun. Got to take off and race between the pits with crews and onlookers lining the course on either side at the start. Speeds were about the same. Entering the mile the ride side of the canopy popped open again. This time (because of the turnaround) there was water and salt inside the cockpit that swirled in the air and also sprayed against the windshield. Again top speed was compromised slightly, but it was plenty fast enough to beat the current record held by Carr in the Bub streamliner. Sam Wheeler had already gone 352 earlier in the meet, and he gave us one last run for our money. On his final start his mainshaft also let go and his chain dislodged, causing further damage. Sam was done and the record was ours! (pending ratificaton by the FIM congress at their upcoming meeting in October) The Top One Ack Attack team achieved their goal. World's fastest motorcycle. The new number that tops the chart is 360.913 mph. Thanks to Top One Oil, Suzuki, and a host of others who made this possible. I'm not used to typing with an ear to ear grin, but for some reason it just won't go away. After surviving a 300mph get-off at last year's speed trials, I wondered if my racing career might be over. Luckily, after a team meeting, it was decided that not only would we rebuild and continue, but improvements would be made that would help us reach our ultimate goal of being the "World's Fastest". There are no guarantees, even though the current record stands at 350mph, and we have already run over 349, it takes more than being good...you have to have a little luck as well. Conditions play a huge role in this sport. Wind, rain, salt conditions (we compete at the Bonneville Salt Flats in Utah) and of course the machine itself, all are important factors. The world’s fastest two- and four-wheeled machines will gather this fall to decide which is the fastest of them all. The TOP 1 Oil World Land Speed Shootout will take place Sept. 22-26 at the Bonneville Salt Flats in Bonneville, Utah. Ten teams, five on motorcycles and five automobiles, will compete in the event sanctioned by the International Motorcycling Federation (FIM) and the International Automobile Federation (FIA) to set official land speed records in their classes. The competition is open to wheel-driven machines that have either set or come close to setting recent land speed records and conform to FIM/FIA technical and safety requirements. The World Land Speed Shootout is organized by Mike Cook of Cook Motorsports. Cook will assemble a panel of judges who will select the ten entrants to the competition. “We’re providing a platform for top contenders,” says Cook. “Land Speed Racing events like Speed Week have become very popular, which is great for our sport, but the number of entries makes it difficult to set new records, due to time constraints. The Bonneville Salt Flats is a popular location for high-speed record setting due to its extremely flat terrain. The 159 square mile area is the final remnant of an ancient lake in what is now northwestern Utah. The ground consists of up to six feet of densely-packed sediments with alkali salts. The surface remains flat and nearly perfectly aligned with the shape of the Earth by rain. To be recognized as an official record by the FIM, a motorcycle must complete two different runs of the track within two hours, once in each direction, with the average of the two times considered for the record. Sam Wheeler-left, Dave Campos-center, and Rocky Robinson-right, three of the four fastest men on two wheels.